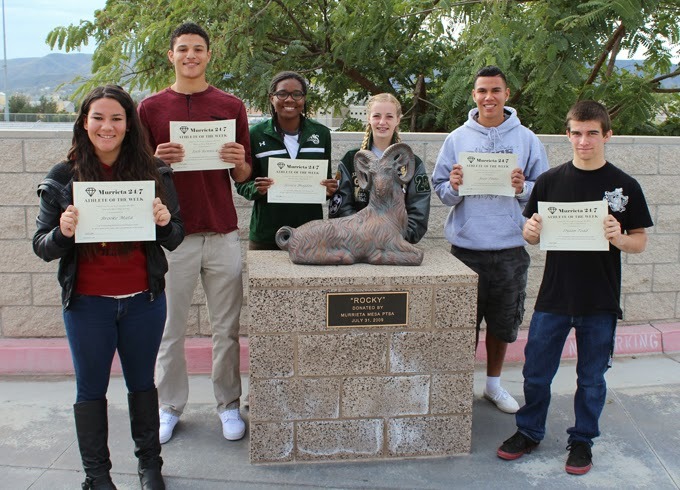 From left: Brooke Mata, Josh Rennick, Jessica Brogdon, Danielle Clark, Jesse Pinto, Dylan Todd. Senior soccer player Jesse Pinto is the team's leader on defense. His coach, Robert Bokma, says Jesse's "passion and attitude helps the team stay focused and keeps us playing strong." Girls water polo player Brooke Mata "is a huge asset to our team offensively and defensively and always has a positive attitude," said her coach, Audra Woods. "She is really proving to be a strong leader on our team." Basketball player Jessica Brogdon had a big game in a 48-43 win over Great Oak for the Rams' girls basketball team. "She is also one of our best practice players every day," said her coach, Kyle Rouse. Also honored for their recent performances were wrestler Dylan Todd, boys basketball player Josh Rennick and girls soccer player Danielle Clark -- a repeat winner from last week. These athletes will be eligible for selection as Murrieta Mesa High School's Athletes of the Month, which will be announced early in February.